The Sony Xperia M5 is a water & dust proof high-range Android smartphone manufactured by Sony and it serves as the successor of the Xperia M4 Aqua. The phone was unveiled on 3 August 2015 along with the Xperia C5 Ultra. The phone is marketed as the Read More.. 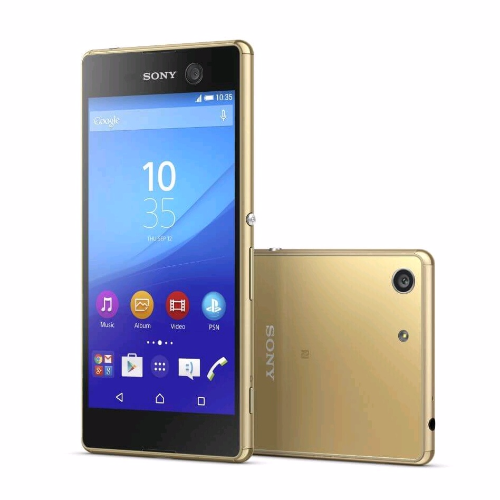 Description The Sony Xperia M5 is a water & dust proof high-range Android smartphone manufactured by Sony and it serves as the successor of the Xperia M4 Aqua. The phone was unveiled on 3 August 2015 along with the Xperia C5 Ultra. The phone is marketed as the "super mid-range" phone.Like its predecessor, the Xperia M4 Aqua, the Xperia M5 is waterproof and dustproof, and has an IP rating of IP65 and IP68. The key highlight of the phone is the 21.5 megapixel rear camera and ISO 3200 along with 0.25 second Hybrid Autofocus that utilizes phase detection autofocus. The Sony Xperia M5 is a water & dust proof high-range Android smartphone manufactured by Sony and it serves as the successor of the Xperia M4 Aqua. The phone was unveiled on 3 August 2015 along with the Xperia C5 Ultra. The phone is marketed as the "super mid-range" phone.Like its predecessor, the Xperia M4 Aqua, the Xperia M5 is waterproof and dustproof, and has an IP rating of IP65 and IP68. The key highlight of the phone is the 21.5 megapixel rear camera and ISO 3200 along with 0.25 second Hybrid Autofocus that utilizes phase detection autofocus. No reviews available for #SonyXperiaM5, Do you know Sony Xperia M5?, Please add your review and spread the good things.